We tested the software on an older iMac that uses a 3.06 Ghz dual core Intel processor , 4 GB ram, using OSX 10.8.2 with an RTL2832U with a E4000 chipset and an RTL2832U with a R820T chipset. Starting with the RTL2832U / E4000, the BorIP server starts very quickly in the terminal window. However, the HDSDR program took several minutes to start and find the RTL2832U stick. Once everything was loaded. HDSDR worked fine with the RTL2832U / E4000 chip. After a few minutes we did notice a little stuttering in the audio, but several background processes were running which may have caused this. We didn’t check that every single little feature worked on HDSDR using Alains’ software. We were just pretty satisfied that at least you could receive ok with the HDSDR and the RTL2832U stick. With the RTL2832U / R820T, the software did not work right away. The reason for this appeared to be because the BorIP server is set by default to an E4000 chip. You have to wait awhile for the everything to time out. When the ExtIO panel comes up try changing the Device Hint to RTL from the drop-down menu. You may have to restart everything after making this change to get it to work. If nothings happens for awhile. you may also have to cancel the box that pops up that says it’s setting up the device and go to the ExtIO screen and have it manually create the RTL device hint. It works with the R820T, but it is a lot tricker to get working than the E4000. There also may be a long pause once you hit the start button in HDSDR, but you should eventually hear some audio. The other issue we ran into is that the Magic Mouse can be way oversensitive to try using HDSDRs’ scroll wheel tuning feature. It appears the program could use a little more tweaking to work better with the R820T. If you are using an E4000 chip you will probably have less problems at this stage. If you are interested in seeing this developed further, you may want to comment on Alains’ website. Thanks to Alain for giving Mac users the ability to easily experiment with RTL2832U sticks. yea no go on my mac either! What is the minimum processor (& speed) needed on a Mac? G5, Intel: coreduo, core2duo, i3… etc. ? Thanks. Works right out of the box, great job. The name of the device is DVB-T Realtek SDR RTL-SDR Receiver tuner stick RTL2832U & R820T MCX Input. I’m interested in this because of the frequency range which is from 25MHz to 1700MHz. Will this device work on my MAC? Thanks for any suggestions and advice you may be able to offer. OS X is NOT a version of Linux! OS X comes from FreeBSD which IS NOT Linux but BSD which is a totally different operating system. Umm, no. Mac OS X comes from the Darwin branch of BSD, not FreeBSD. Binaries aren’t really compatible between the two. However, there are numerous ways to make them compatible– with reservations in terms of how the Mac OS protects its ports, and does things in the Apple file systems. BSD is not a totally different operating system, it’s the alternative that University of California at Berkeley made to AT&T licensed Unix. Linux, OTOH, is not Unix, but is made to be very very Unix-like; BSD/Berkeley Software Distribution is licensed differently, and Darwin is available on the Internet if you want to get especially close to Mac OS. Ultimately, it’s better to just join Apple’s developer program if you’re interested in depth. ‘OS X comes from FreeBSD’ sounds more true than ‘OSX is basically a custom version of Linux’. and Linux is totally not UNIX. I am really pleased I found the above. I have been using HDSDR under VMWare Fusion and it works fairly well but with the odd glitch on my 2007 iMac. It is my preferred SDR prog. I was dubious about trying this but it works with my FUNCUBE PRO PLUS, and much more smoothly. All I did was to put the Funcube’s ExtIO DLL into the HDSDR folder in the package and bingo. Did yours work out of the box when you selected the Funcube’s ExtIO DLL from the drop down? Mine is saying hardware not ready? You are correct, contrary to my original post. The ExtIO does not get picked up but HDSDR works with the Soundcard [F5] input set to FUNcube Dongle V2. I had originally thought that this was via the dll but clearly it is not. Works fine with my MacBook Air (2011) with the “RTL” device hint and a fc0013 / RTL2832U dongle but NOT with a R820T / RTL2830U . The borip server says it has found the 2832 (EZcap EzTV) but hasn’t implemented the tuner interface. While borip is “probing” for tuners it doesn’t even say R820T , all the others are mentioned. Is there another version of borip that includes the R820T? I use a Bonito RadioJet on my iMac, running in Win XP sp3 under VMWare, on OSX 10.8.4 with no problems. The VMWare being the crucial item giving correct access to the iMac’s USB ports and sound output devices. I try this one, It’s working good. Somehow, I feel that the number of freq. show on screen and the one picked up on my radio isn’t the same, but the same sound. I am using RTL2832U with a E4000 chipset. borip_server has encountered a fatal error, and will now terminate. Looks to me like some issue with python framework – whatever that is. Cant get er to work! on my mac. i bought http://www.ebay.com/itm/151280105098 and after some work to figure out how to get it to come up and work but i found a problem. i decided to tune to my local radio at fm 1065 all i get is a tone that varies as i change the frequency to either side. is one of the following the case? 1. the model i got is the one listed in above url is the wrong model and should be the one that comes in larger packaging and dongle is 1 inch square instead of the long 1 by 4 inch rectangle (i placed order for the smaller dongle). 2. a customs crackdown has banned what frequencies we are allowed to tune into (sort of why police scanners are not allowed to tune into cell phone frequencies). 3. digital dongles no longer support analog and many fm and other radios did not upgrade to digital. 4. defective unit (i ordered new one because just the shipping alone would void out much of the return + i felt a burr on the end as if the unit had been opened (possible to get picture of the board) so i dont know if they damaged it getting the picture). i was not trying to spam i was just pointing to an item. You provide wrong information here. OSX is not a version of Linux. OSX is based on BSD Unix. The Mac and RTL-SDR have come a long way this last year. I am running gnuradio with rtl-sdr and apps like rtlsdr-scanner all natively on my Macbook Pro. Installations like gnuradio, Gqrx and all can all be installed using MacPorts now. As simple as “sudo port install gnuradio” for example. Everything worked as described, however I am only receiving static, no audio. tried to tune to local FM channels as a test. Usually works on rtlsdr under windows. Also the wave appears the same no matter what frequency I set it to. Anyone else had this problem ? Try and follow this: http://www.cubicsdr.com A very interesting development. Now it’s oct 2015 & nothing seems to have changed; I’ve got the same problem: no wave of frequencies only noise even with a PMR Walkie Talkie right beside of the receivers antenna, no audio to listen to, only noise. 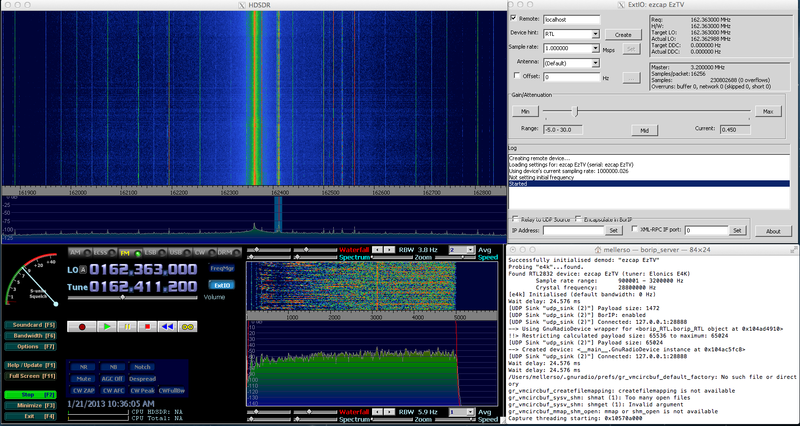 Both CubicSDR v0.1.4-beta & CubicSDR v0.1.3-beta are not running at all on my 2007 iMac. I was able to install HDSDR through Wine on OSx. The installer is a lot smaller compared to .dmg file, that´s why I did this. I try to save every MB, because I use a small SSD (120GB). The program starts and works nicely, but I don´t know what to do to make the RTL “drivers” to be recognized and work on a Mac. The method described on this site did not worked for me under Yosemite (and now maybe even worse, I´m using El Capitan already). Any tips are welcome. Thanks. I recommend you guys to upgrade the information on the old post so more people will see it. Thanks for the AWESOME work. I decided to install the .DMG file based on version 2.70 and it worked 100%. I am very grateful to Alain for having done so. Alain, do you have a blog with a Paypal button? You need to start getting donations from users, seriously. I can´t do it now, but I assure you I will donate you soon I get a job. In the meanwhile SDR will help me to not feel so anxious and depressed, specially now when I will have to cancel my internet service. Mac OS X is a custom version of Linux? That statement couldn’t be more wrong. Both operating systems are built upon BSD Unix, one (Mac OS X) with the Mach Kernel, and the other Linux with the Linux Kernel. Mac OS X was in NO WAY derived from Linux. Totally wrong, they are unrelated operating systems. You should correct this mistake. However, there is crossover between the two, in that some apps and libraries have been ported over to OS X from the GNU/Linux world. These can usually be found on MacPorts, essentially the OS X version of the FreeBSD Ports collection.